The Golden Pei is not a purebred dog. 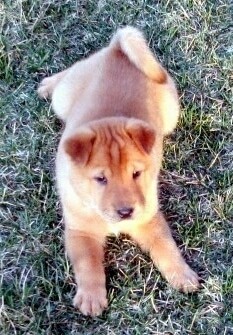 It is a cross between the Chinese Shar-Pei and the Golden Retriever. The best way to determine the temperament of a mixed breed is to look up all breeds in the cross and know you can get any combination of any of the characteristics found in either breed. Not all of these designer hybrid dogs being bred are 50% purebred to 50% purebred. It is very common for breeders to breed multi-generation crosses. 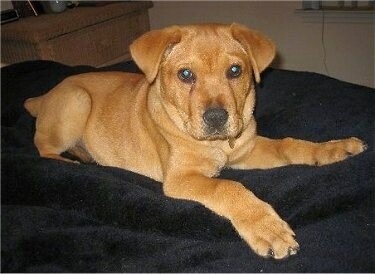 "Trixie is a female, 2½-month-old Shar-Pei / Retriever. We have had her for just two days and quite frankly cannot imagine life before she arrived. 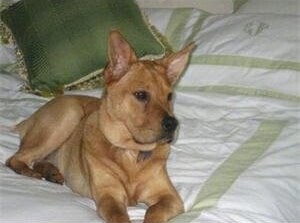 "She is from a local breeder in the Chicago area and comes from pure bloodlines on both sides of her breed. 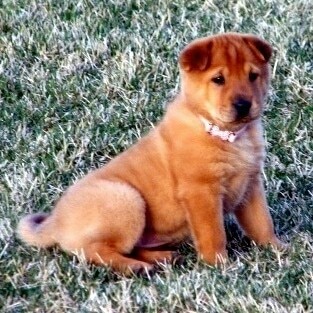 As you can see in the picture, the Shar-Pei is more dominant in her. "Her temperament is superb. She made herself an enjoyable member of the family within minutes of her arrival. She seems to already be housebroken because she will let us know when she is ready to go out and has yet to make a make a mistake inside of the house. She is loving, affectionate and extremely intelligent and I am amazed that she is only 2 ½ months old because she behaves as if she has had formal training and would be much older. "She follows at my heel and a leash is not necessary on walks. Actually, she made it clear that she doesn’t like leashes and will stop walking when I put it on her. Once I take it off, she is at my heel. When I walk so does she, when I stop, so does she, regardless of what’s going on around us. She is not easily distracted and it is easy to keep her attention. She is not afraid of the new sights and sounds in her new world and has made it clear that she intends to play on every square inch of our ½-acre lot. "She already has a favorite toy ‘binkie’ and loves when you try to take it away from her. When she wrestles it away from you she trots off regally as if she is a conquering queen with a triumphant ‘WOOF’ to drive the point home. "In the picture above you can see that she has a regal stance and her gait is that of a trot seen on many show dogs. She walks and stands with self-confidence. 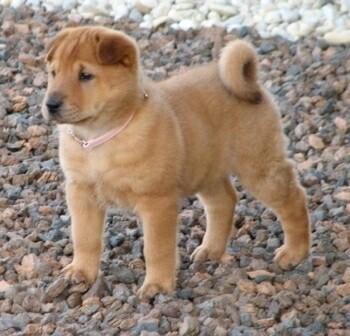 "The fact that she is such a cute puppy and her fuzzy coat and fat bottom make her very endearing. When she lies down her jowls flop and she looks up at you, you just want to burst into tears and can’t help but go awwwww! "We have not seen any bad attributes yet, she’s been with us such a short time, but she has so many positive traits of both breeds that we will continue to reinforce those and if any bad ones show up we will nip them in the bud. From what I have seen described for both breeds, this dog has the best of both in spades. "I am looking forward to spending the journey with the newest member of our family."